One Plane. Two IAM Women. 2,717 Miles. Two members of Daytona Beach, FL Local 610 recently won the 40th annual Women’s Air Race Classic. 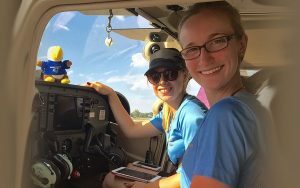 Instructor-Pilots Emmy Dillon and Abbie Pasmore of Embry-Riddle Aeronautical University topped 54 other teams in the 2,717-mile cross-country air race. The four-day race included 8-10 hours of flying a day in a small single-engine piston aircraft. The race began in Prescott, AZ and stopped in Albuquerque; Midland and Waco, TX; Arkadelphia, AR; Warrensburg, MO; Champaign/Urbana, IL; Murfreesboro, TN; and Americus GA, before arriving at Daytona, FL. The first Women’s Air Race Classic, featuring the legendary Amelia Earhart, took place in 1929. The two women took home the $5,000 first-place prize and Bose headsets. Both Instructor-Pilots are earning degrees from Embry-Riddle. “This race has helped me become a more well-rounded pilot and a better instructor to my students,” said Pasmore, a graduate student who hopes to develop a career in ergonomics, or flying. The Women’s Air Race Classic is a non-profit organization that works to promote and preserve the traditions set by pioneering women in aviation.